A multi-year research project to explore the most effective ways to encourage Native Americans and Native Hawaiians to become engineers is distributing a book about the initiative. The intent is to share lessons with people who run those programs or who have an interest in bringing engineering education to any underrepresented group. Among the advice: Make the learning culturally relevant and hands on. For example, on one reservation tribal leaders requested help from the students to research how uranium mining south and west of the reservation could affect soil and water quality. The PEEC Experiment: Native Hawaiian and Native American Engineering Education is a 298-page report freely available in digital form on the South Dakota State University website. The book, written and edited by 40 contributors, covers programs in Hawaii, North Dakota, South Dakota and Wisconsin involving 17 colleges and universities. The work profiled in the book formally began in 2010 when the National Science Foundation funded what became the nine-year-long Pre-Engineering Education Collaboratives (PEECs) with 12 grant awards totaling in the millions of dollars. The NSF program was structured to encourage pre-engineering students to take their first two years of classes at their local Native-serving colleges and then transition to a university engineering school for their junior and senior years. "Overall, researchers found that culturally relevant, research-based, hands-on teaching and learning had the greatest impact on recruiting and retaining engineering students," said Suzette Burckhard, a civil engineering professor at South Dakota State, and co-editor of the volume, along with Joanita Kant, a research scientist in the civil and environmental engineering department at the same university. As an example, at Oglala Lakota College in South Dakota, a major challenge was the sheer small number of students studying pre-engineering. While the "traditional engineering curriculum" was based on "gateway classes, bottleneck classes, strict adherence to sharply defined courses of study or adherence to a single discipline of study," under the NSF work, the department envisioned a program where students at different levels and in different programs and classes worked together in one or more interest-based groups. "The faculty wanted students to have the freedom to move between groups and to be engaged with faculty, students and research of interest to them," the researchers wrote. "For their part, the faculty assumed that eventually students would find their niche and complete their academic program." Following a realignment of curriculum, the engineering department raised its retention rate from 20 percent to 60 percent, quadrupled its number of annual graduates (from a low of two to eight, with a high of 10 in 2016) and placed 96 percent of its students in jobs on the reservation or in graduate school. 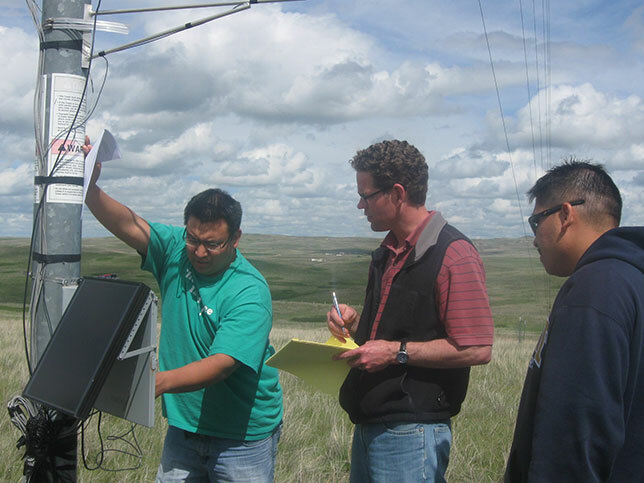 The Natural Resources Regulatory Agency on the Pine Ridge Reservation brought PEEC researchers and students into the uranium mining project. Having tribal members take measurements and generate baseline data will help communities protect their resources, said Burckhard, in a prepared statement. "That increases tribal sovereignty and self-reliance, because if they don't have their own evidence-based data, data from outsiders will be used." Besides hands-on projects with relevance to the students, the researchers also learned the importance of having "champions, community and family members to support students," added Kant. Oglala Lakota College instructor James Sanovia, a PEEC co-principal investigator, emphasized the importance of having a support system — both at home and at the larger university. The encouragement of their professors and mentors were key elements that helped them complete their degrees, he suggested, in a chapter titled, "Finding an Engineering Identity: A Native American PEEC leader's experience." Sanovia is the first — and so far, only — Oglala Lakota geological engineer. Currently, he's pursuing a master's degree from the South Dakota School of Mines and Technology. The book is available on the South Dakota State University website here.